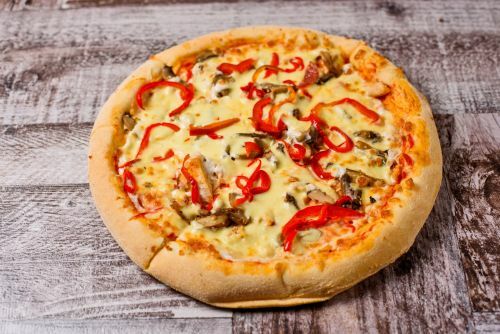 Johnny Boys Pizza & Pasta - Frankston uses their own specialised couriers to deliver their food. All pizzas have a tomato base with cheese on top! Ham, mushrooms, chicken and bacon. Mushrooms, onions, capsicum, freshly cut tomato and olives. Ham, hot salami, mushrooms, onion, capsicum, prawns, anchovies and garlic. Ham, mushrooms, olives and anchovies. Chicken, freshly cut tomato and oregano. Ham, hot salami, bacon, cabanossi and BBQ sauce. Hot salami, olives, anchovies and garlic. Ham, hot salami, mushrooms, onions, capsicum, pineapple, prawns, olives, bacon, anchovies and garlic. Tandoori chicken, onions, capsicum and chilli. Ham, hot salami, capsicm, olives and chilli. Cheese and garlic base, fresh tomato, spring onion, spanish onion, oregano. Ham, mushroom, salami, onion, beef, garlic and oregano. Hot salami, chicken, beef, capsicum, oregano and tabasco sauce. Hot salami, capsicum, freshly cut tomato, olives, chilli and garlic. Hot salami, mushrooms, onion, jalapenos, capsicum, chilli. Ham, mushrooms, hot salami, capsicums, onions, beef, sliced tomato. Fresh chicken, sweet potato, avocado, tangy sauce. Fresh chicken, onion, capsicums, sweet chilli sauce. Minced beef, freshly sliced tomato, onion, bacon, egg. Minced beef, onion, bacon, bbq sauce. Shaved virginia ham, mushroom, Spanish onion, kalamata olives, mix of ricotta & bocconcini cheese. Spaghetti and bolognese sauce with parmesan cheese and herbs. Smoked chicken, mushrooms, Spanish onions, ricotta cheese, served on a BBQ sauce. Asparagus, baby spinach, oven roasted capsicum, Spanish onion, kalamata olives, ricotta cheese, topped with basil pesto and herbs. Tiger prawns, sundried tomato, mussels, calamari, garlic, bocconcini, herbs and a splash of chilli sauce. Homemade meatballs, Spanish onion, fresh tomato, crispy bacon dressed with fresh basil and BBQ sauce topping. Pepperoni, spring onion, Italian sausage, garlic with cracked pepper and herbs. Shaved Virginia ham, salami, Italian sausage, crispy bacon, mushroom and bocconcini cheese. Fresh baby spinach, grilled eggplant, oven roasted capsicum, sundried tomato and feta cheese. Shaved ham, baby spinach, sundried tomato, kalamata olives, roasted red capsicum, feta cheese, garlic and chilli. Hot Salami, onion, capsicum, beef, red kidney beans, dressed with sour cream dusted with sweet paprika and hot chilli. Tender roast lamb, onion, fresh tomato, dressed with tzatziki sauce.